Selling out in record time, award-winning Barn on the Farm festival today makes its final announcement to this years unstoppable line up. Championing the best in emerging and up-coming artists BOTF’s carefully tailored additions include, for the main stage Saturday, Lake District duo, Aquilo, hotly tipped Charlotte OC and folk singer song writer, Marcus Foster. They are also joined by Cash & David, Apostle Thomas, Ava Lily and Jasper in the Company of Others plus many more. BOTF maintain their strong line up announcements as one of the best independent music festivals in the UK for discovering new talents in their unique intimate space. Heavily renowned for their carefully created line-ups predicating future success, this year’s announcement have been on par, with the final additions as no exception. Leading the additions include the hugely talked about Aquilo who after their sold out show in London and their beautiful second EP, ‘Human’ have received solid support form the likes of Radio One’s Huw Stephens’s, Annie Mac and Zane Lowe. Joining the line up include Marcus Foster who's tracks have been featured in Twlight and Five Dollar a Day plus the extremely talented Charlotte OC who released her sensational EP ‘Colour my Heart’ earlier this year which has seen her go from strength to strength. Also revealed today is one of The Guardian’s New Band’s to watch, Cash & David who comprise of an all female-fronted electronic pop trio, London based four piece Apostle Thomas,euphoric folk-pop Jasper in the Company of Others and Ava Lily. The intimate Friday sees additions alongside the very special secret headliner who will be revealed on the night. Line up consists of Mike Dignam that recently supported Lawson on their sell out tour, Ady Suleiman who caught the ears of 1Xtra's Mistajam with his sensational track 'Serious', duo Bright Sparks plus newly emerging Ella Walker, Harry Mundy, Declan Donovan and Lily Rendle- Moore. 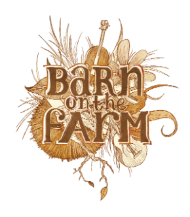 The announcement today joins the already stellar line-up including Brit Award Winning James Bay’s only UK headline performance, The Staves, Jack Garratt, Prides, Rhodes, Amber Run, Little Comets, Foy Vance plus many, many more for what is turning into one of the most exciting Barn on the Farm line ups to date.